Job hunting in is nerve racking. 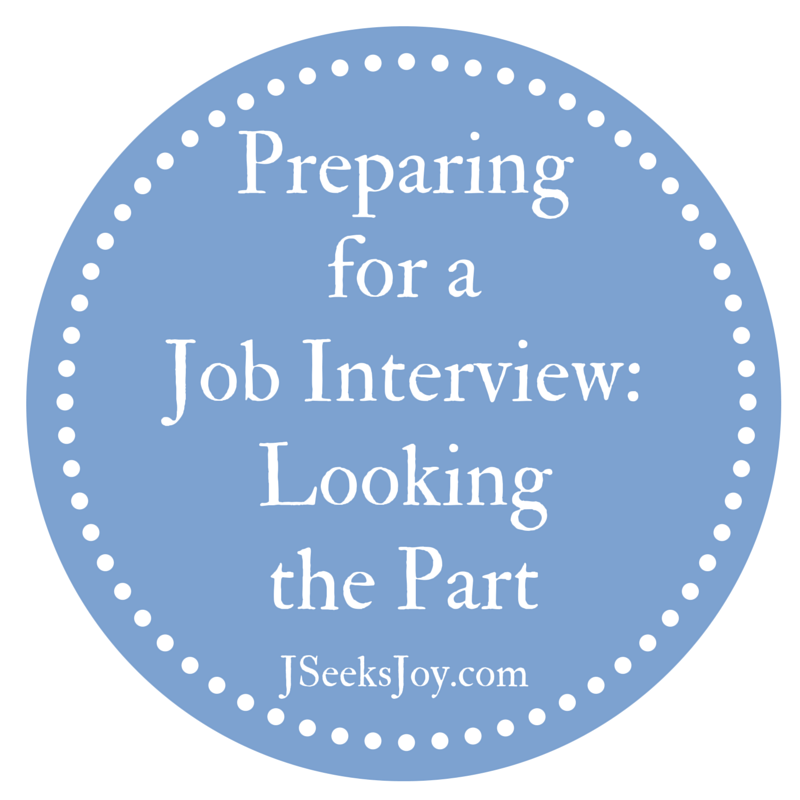 Searching for openings, writing cover letters, updating your resume, waiting with bated breath for the phone to ring… By preparing adequately ahead of time, your appearance should be the least of your worries. After all, you have to strategize how to answer the tough questions they’re bound to ask you in your interview. And of course you have to research the company! Having gone through pages and pages of advice on how to dress for a job interview, here’s what I think are the most important things to keep in mind from head to toe. The emerging theme? K.I.S.S. Keep It Simple, Stupid. Hair. Don’t get liberal with your hairstyle. There’s a time and place for that, and a job interview isn’t it. Make sure you keep it simple. A low chignon, half up with a nice clip, or down if you won’t fiddle with your hair the whole time. I play with my hair more often that I probably should when I’m a bit anxious, so I always make sure to put it back in a nice way for an interview. Whatever you do with your hair, just make sure you look put together. Don’t just hop out of the shower and let it air dry. Blow dry it, curl it, straighten it… Just do something simple with it. Make up. Again, there’s a time and place for fabulous make up, and a job interview is neither. Ordinarily, I do neutral eyeshadow, no eyeliner, highlight my under my arches in my eyebrows with a light shimmery color, put on some blush, mascara, and light lipstick. I think of it like this: I don’t want to be remembered as ‘The-girl-wearing-all-of-the-make-up’. Less is more in these situations. Jewelry. No dangly earrings. As much as you may love them, save them for another time. Classic studs will do just fine. Simple jewelery is the way to go. If you have a nice watch, think about wearing that too. The outfit. This will depend on the position and company you’re applying to, but I find that being over-dressed will never be held against you. If you’re unsure, get more professional. For example, for my last job interview I was nervous about wearing my full suit. Sometimes, I feel like a kid wearing her mom’s work clothes in my suit. But after trying on a few outfits, the suit was my safest bet. Again, being over-dressed can’t hurt. So, I had on a long sleeved button down, suit jacket, matching suit skirt, pantyhose, and sensible high heels. I was more professionally dressed than my interviewers, but I felt confident. And that was important. Takeaway: when in doubt, suit it up. Accessories. Other than jewelry, you’re likely going to carry your purse to your interview. Choose wisely. I carry a brown jacquard Michael Kors tote with brown leather accents. It’s big enough to fit my padfolio, folder with copies of my resume, an umbrella, a water bottle, and my purse contents. If you don’t have a ‘nice’ looking bag, you can definitely find one at a place like Kohl’s or Target for cheap. Undergarments. Okay. This is the elephant in the room. I don’t really care. Invest in a pair of either control top pantyhose or Spanx. A good outfit starts with what you wear underneath it. Shoes. When I say sensible shoes, what I mean is a pair of heels. Not stilettos, or platform pumps, casual wedges, or anything open toed. Simple, classic, black heels with a maximum 3″ heel. You can wear a nice pair of black flats if you’re not comfortable (or graceful) in heels, but I always wear heels. Perfume. Skip it. They should see you, not smell you. What if your perfume ends up making them sneeze and cough? What if it’s the perfume their ex used to wear? Or the stuff their evil step-sister wears? If money is tight, I’d say be frugal with everything but your suit and your shoes. A nice suit that fits looks polished and professional. And your feet with thank you for sparing them from another awful pair of Target shoes that just give you blisters. I spent around $40 on my interview heels, which isn’t breaking the bank, but it was worth it to get a pair that wouldn’t maim my feet. If you do have a pair of shoes that hurt, buy cushion-y inserts for heels. They are cheap and at the same time invaluable. Also think about buying a Band-Aid Active Friction Block Stick. I’ve never used it (I’ve used Vaseline in a pinch) but I’ve seen bloggers swear by the stuff. Bring something to take notes with. I mentioned my padfolio, and I love it. It’s pleather and $12 (I’ll get a nice leather one when I can afford it!) but it’s simple, and has a place to hold my pen, business cards, and paper to take notes on. If you do need to jot something down you want to remember, ask politely if your interviewer minds if you take notes. Bring a copy of your resume. Just in case. I’ve never needed mine, but I always have them with me. Don’t eat anything offensive beforehand. That means things like onions, garlic, carbonated beverages, and anything that will make you bloated or uncomfortable. Bring along some breath mints, too. Even if your breath is fine, popping a mint beforehand can’t hurt.